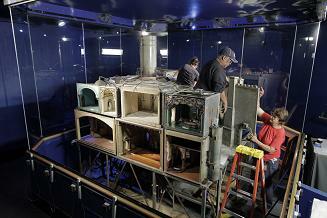 Chicago (November 21, 2013)—Colleen Moore’s Fairy Castle—a fairy dream home of fantastic proportions—is getting a facelift at the Museum of Science and Industry, Chicago (MSI) this winter. 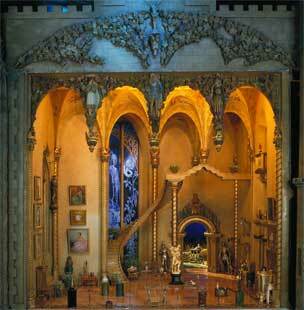 The nearly 9-foot elaborate house was completed in 1935 by silent film star Colleen Moore and is filled with remarkable miniatures and artifacts collected from celebrities, artisans and craftspeople around the world. The Fairy Castle structure, which took seven years and cost $500,000 at the time to create, is in need of conservation to stop ongoing deterioration and ensure its long-term preservation. The conservation project will focus on repairing damage to the structure, some of which was caused by its 80-year-old electrical and plumbing systems, and replacing these systems with more sustainable options. This project will begin on November 12 and run through mid-February 2014 in a public gallery space, providing a unique opportunity for guests to see a beloved MSI icon in a whole new way. This exhibit is included in Museum Entry. Guests will be able to watch and engage with structure conservators from Litas Liparini Restoration Studio as they work Tuesdays through Saturdays. For the first time, guests will be able to view each room from all sides (the Castle can actually be broken down into 200 individual pieces) and learn how the entire Castle was built and fits together. On Sundays and Mondays beginning December 8, the public will be able to see book conservator, Bozena Pszczulna-Szymanski of Paper Conservation Studio treat 58 miniature books from the collection of more than 80 books created exclusively for the Fairy Castle library. Some of these rarest books include hand printed excerpts from John Steinbeck’s Of Mice and Men, Agatha Christie’s At Bertram’s Hotel, Willa Cather’s Shadow on the Rock and even a first edition fully illustrated book by Edgar Rice Burrows Tarzan Jr. Each book will be treated to stabilize their condition including vacuuming; repairing the spines and consolidating the aging paper. In addition, the more than 1,500 precious artifacts that have been collected from around the world and that fill the rooms of the Castle will be on display, providing an unprecedented up-close view of these precious objects. Artifacts include: a Syrian glass vase from 740 AD; a painting donated by Walt Disney; an authentic Roman Bronze head; tiny needlepoint tapestries created by a master needleworker in Vienna; the smallest Bible in the world; and more. The conservation work for the Castle requires extensive expertise in chemistry and material science as well as general knowledge of manufacturing and hand-crafting processes. While glowing lights and flowing water bring the Castle to life, the condition of the electrical and plumbing systems have damaged the Fairy Castle over many decades. The ceilings and walls of many rooms have been scorched by the lighting over time; and the floors have buckled due to water leakage from the aged plumbing system. The cloth-covered electrical wires are old and brittle, and the miniature light bulbs used throughout the Castle are no longer manufactured. The lights will be refurbished using contemporary lighting technology that will preserve the historic look of the Castle without causing further damage to the artifact. The five water features in the Castle will be restored and replaced with cast acrylic and fiber optic technology to replicate flowing water and prevent future damage from leaks. The original plumbing system will be treated for corrosion and left in place to preserve the historical integrity of the artifact. After the public conservation concludes in February, the Castle will be reassembled and the exhibit will re-open to the public in mid-March 2014. PLEASE NOTE: Conservators will take a holiday break from December 23 – 29 and the conservation gallery will also be closed from January 4 – 14. Colleen Moore was a silent film star in Hollywood during the 1920s, and her position as one of the most popular actresses gave her the resources to make a childhood dream become a reality. 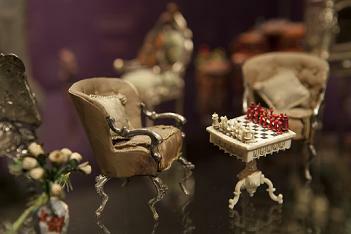 She owned several elaborate doll houses as a child, but later in life, her father suggested she should pursue her passion for miniatures and doll houses by creating one of her own. In 1928, she began the plans for a majestic dream home. She enlisted architect and set designer for First National Studios, Horace Jackson, to create the floor plan and layout, while art director and interior designer Harold Grieve, who had redesigned Colleen Moore’s mansion, assisted with the interiors. Between 1928 and 1935, about 100 people worked on the Fairy Castle. In 1935, Moore organized a national tour of the Fairy Castle to raise money for children’s charities, and it stopped in the toy departments of major cities’ department stores. 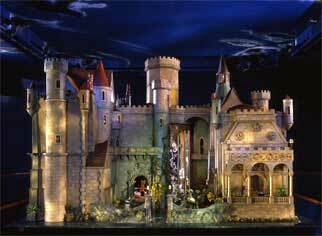 In 1949, Major Lenox Lohr, president of MSI, convinced Moore to have the Fairy Castle make one final stop at the Museum, where it has become a favorite permanent exhibit, visited by millions and loved by generations for the remarkable creativity and imagination it represents. The Museum of Science and Industry, Chicago (MSI), one of the largest science museums in the world, offers world-class and uniquely interactive science experiences that inspire inventive genius and foster curiosity. Through groundbreaking and award-winning exhibits that can’t be found anywhere else, to Live Science Experiences that make you the scientist—a visit to MSI is where fun and learning mix. Through its Center for the Advancement of Science Education (CASE), MSI offers a variety of student, teacher and family programs that make a difference in communities and contribute to the Museum’s larger vision: to inspire and motivate children to achieve their full potential in science, technology, medicine and engineering. Come visit and find your inspiration! MSI is open 9:30 a.m. – 4 p.m. every day except Thanksgiving and Christmas day. Extended hours, until 5:30 p.m., are offered during peak periods. The Museum is supported in part through the generosity of the people of Chicago through the Chicago Park District. For more information, find MSI online at msichicago.org or call (773) 684-1414 or (800) GO-TO-MSI outside of the Chicago area. PreviousWho’s the Beauty, Who’s the Beast? 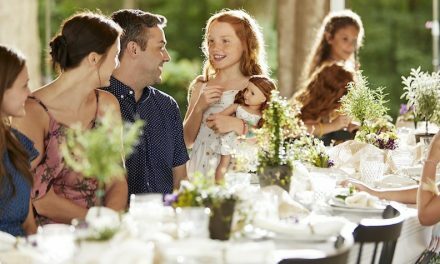 NextThankful and Delightful: A charming and nostalgic doll salute to Thanksgiving dolls, past and present.